You need theWii LAN Adapter With an amazing newLAN Adapter for theNintendo Wii, you can create a wired high-speed internet connection for your console. Multiplayer battles on your Switch and Wii consoles can get heated and the slightest delay can lead to you losing the match. 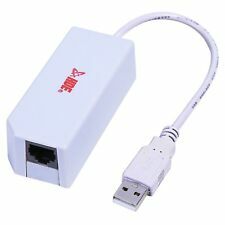 Never fear lag caused by WiFi connections again with an easy to use plug and play Ethernet adapter. Simply connect to an available USB port on your Nintendo Switch or Wii console, connect via Ethernet Cable (not included) to your router or cable modem, and get ready for fast paced multiplayer action. Whether it is fierce battles in Smash Bros, intense races in Mario Kart, or spring loaded knock out action in Arms this adapter will give you the edge you need to win in online matches. Adapter is also compatible with Wii-U consoles. Adapter measures 11" in total length. Condition will be excellent to like new. 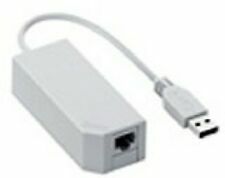 Rocketfish LAN Adapter for use with Nintendo Wii system. This plugs into a USB port on your Nintendo Wii console and gives you a Ethernet Network port so that you can connect it to the internet! Set is new in the original box. USB to Lan Wired Connection. Will work with Wii - Wii U - Switch. This pre-owned Nintendo network adapter is in good working condition, Lightly used. Adult owned. See all pictures to get an idea of condition. LAN Network Adapter w/ Ethernet Cable by RocketFish for Nintendo Wii Console. Nintendo Wii Lan Adapter by Datel With 5 Ft Ethernet Patch Cable. Contains plastic sealing around ethernet cable, discoloration on USB port as a result of age. Nintendo Wii Lan Adapter by Datel With 5 Ft Ethernet Patch cable, instruction booklet and original box and packaging. If you would like to also buy the Nintendo WiFi Connector I am selling please contact me for combined discount for shipping. OEM Nintendo Wii,Wii U & Switch Grey Lan Adapter RVL-015 RLV015 USB Internet. Condition will be excellent to like new. You are purchasing a Rocketfish "Lan Adapter" for use with Nintendo Wii systems. 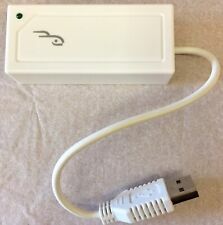 This plugs into a USB port on your Nintendo Wii console and instantly gives you a Ethernet Network port so that you can connect it to the internet! Get your Nintendo Wii system connected to the Internet with this LAN adapter. Hop online with no wireless network required and maximize the fun of your Wii system. USB 2.0 connection provides a high-speed LAN Internet connection. Compatible for Nintendo Switch console and any devices with USB 2.0 port Enables you to add a network to your switch console via connect to the RJ45 interface USB 2.0 port and 100Mbps make the transmission speed is fast and the network connection is stable Material: high quality ABS Packing Included: 1*Switch Lan Connnection Adapter Brand DOBE Type LAN Connection Adapter 100Mbps To Fit Nintendo Switch / Wii U Model TNS-849 UPC 6912917048652 MPN Does not apply. Condition // new in open box. Nintendo Wii Part: Rocketfish LAN Adapter with ethernet cable. For online internet connection (not included). never used. Classic Piece for Years to enjoy. Nice fabric, solid feel and wear. Nintendo Wii LAN adapter with 6ft cable. Create a High-Speed LAN internet connection for your Nintendo Wii via a USB 2.0 Connection. Accessory ONLY. Nintendo Switch, Wii U, Wii not included. Compliant with both USB 2.0 and USb 1.0 / 1.1 specifications. USB powered, no external power required. Color: Gray. NYKO 87024-E14 Net Connect Wired LAN Adapter Nintendo Wii USB Internet. Condition is New. Shipped with USPS First Class Package. Plug to Nintendo Switch dock or WiiU Wii console, and connect an Ethernet cable to network adapter. Weak wireless connection?. Try our reliability wired internet connectivity USB adapter. The USB adapter supports 10/100M fast Ethernet. Features: Connects to an USB port on the Nintendo Switch and makes a direct connection to your broadband modem. Get rid of the network delays while playing online video games with poor WiFi signal. Very simple installation with just plug and play, which is easy to use. RJ-45 connection port allows for fast Ethernet performance. You can enjoy a fast and reliable internet connect for online gameplay, internet, movies and so on. High Speed USB 2.0, transmission speed up to 480Mbps. Specifications Color: White USB: USB 2.0 Compatible for Nintendo Switch, Wii, Wii U console Type: Ethernet LAN Adapter Package includes: . LAN adapter for Nintendo Wii or Wii U.
Wii LAN adapter | Cable adapter. This adapter is necessary when connecting the Wii to the Internet via wired LAN It corresponds to 10BASE-T and 100BASE-TX. Even if you think to yourself, "But the item I want is only available in Japan.". Switch / Wii LAN connection adapter with easy installation. Fast transmitting speed with stable network connection and compatible switch host and PC. Suitable device: for N-Switch / Wii. USB: USB 2.0. Features:Instantly creates an Ethernet connection from any USB port for faster and more reliable internet connection.Plug and Play. Easy installation.USB powered, no external power required.Integrated single chip fast ethernet MAC controllerEliminate dropped or no signals from wireless networks.Compliant with both USB 2.0 and USb 1.0 / 1.1 specifications10/100Mbps N-way auto negotiation operationInternet access via cable network for your Wii" / "Plugs into DSL, Cable Modem or RouterFaster connection than WiFiConnectors: 1 x RJ-45 jackCompatible with Nintendo Wii / Wii U/PCSpecifications:Dimension:Approx.84 x 35 x 25mmCable length:Approx. 18cmColor: GrayNet Weight:46 gPackage weight:56 gPackage Included1 x LAN Ethernet Network Adapter for Nintendo Wii / Wii U.
Wii YOUR adapter is required when connecting to the Internet in a wired LAN. The Wii a wired LAN is an adapter that is required in the case of Internet connection. It supports 10BASE-T and 100BASE-TX. Just Plug and Play No Need To Download Driver, you can simply use it by connecting to the USB port of your personal computer. Compatible with Nintendo Switch, Windows 10/8.1/8 Specification 1. Material: Aluminum alloy 3. HAS LIGHT SURFACE SCRATCHES . IN GOOD CONDITION~. SEE PICTURES.